In pre-dawn raids Sunday morning in the southern part of the West Bank, Israeli forces raided the homes of ten Palestinians and took all ten from their beds, forcing them into military vehicles and taking them to unknown destinations for interrogation and detention. The military abducted five Palestinians from the Bethlehem area, and five from the Hebron area. In the Bethlehem area, the Israeli soldiers abducted five Palestinians, including a father and his sons, during raids to the south and east of Bethlehem. According to the Wafa News Agency, the Palestinians abducted by the Israeli military Wednesday morning were Hatem Jabr Deeriyya, 42, and his sons Yusef, 17, and Mousa, 15, from Beit Fajar village in the south, after raiding and searching his family home. 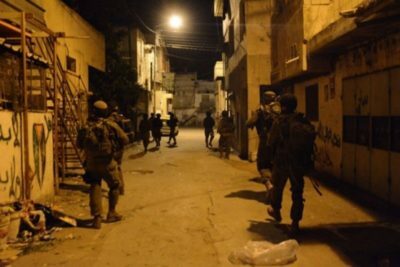 In the town of Teqoa, southeast of Bethlehem, the Israeli forces abducted Mohammad Nayef Abu Farah, 24, and Mohammad Suleiman Abu Farah, 29, and searched their homes. Israeli occupation forces abducted four citizens from Al-Arroub refugee camp north of Hebron on Sunday. The troops also abducted former prisoner and editor Zaid Akram al-Qawasmi, and handed him over to the Israeli Intelligence unit – a unit that is infamous for so-called ‘harsh interrogation’ techniques that are classified as torture under international law. Palestinian security sources reported that the Palestinians abducted by the Israeli military in al-Arroub refugee camp as: Kareem Muslim Abu Sal, Obaida Imad Al-Ra’i, Hussin Yousef Jawabra and Haytham Al-Badawi .